Your week is full of deadlines. But in order to meet them, your team often loses hours to exhaustive search and file-sharing practices. Using that time for more creative concepting could make for bigger long-term gains. And Adobe has the tools to help. Adobe Creative Cloud Libraries allow your workgroups to collaborate and share projects across programs and computers—no matter their individual locations. And Adobe Stock seamlessly integrates images for direct placement into apps like Adobe Photoshop, Illustrator, and InDesign. 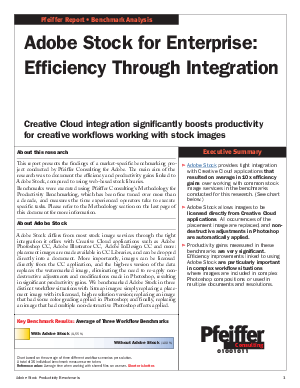 Download Pfeiffer Consulting’s new Adobe Stock Benchmark Reports to learn more about the efficiency and productivity gains linked to using Adobe Stock.